I think I'm going to use the oval beads and the round beads right above them to accent a right angle weave rope that I've been intending to try. 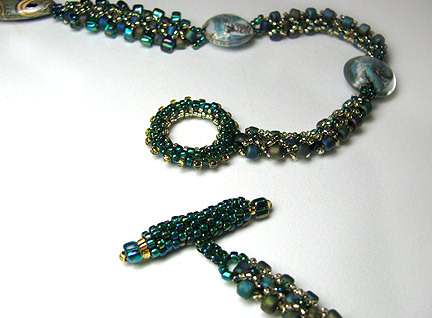 The rope can be found in Marcia DeCoster's book Beaded Opulence. Assuming that I do make this piece, I'll share pictures of it when I'm done. Well, it worked out even better than I had hoped. Most of you know that bead embroidery and not beadweaving is my primary thing. 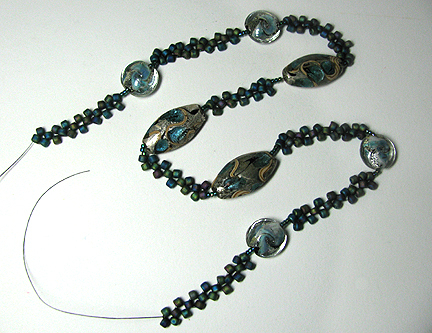 I sometimes get sloppy and miscount the beads, because I like to listen to recorded books while I work. Fortunately for me, Marcia's instructions are so easy to follow that once I got going, it was pretty much idiot-proof. 1. I started by weaving right-angle weave sections between the beads. 2. I added the full embellishments to the base in the middle section, but added a bit less to the upper sections of the RAW strand. The criss-cross pattern is stitched on both sides of the strand. 3. 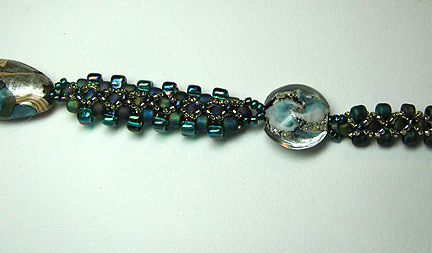 I used a variation on Laura McCabe's beaded toggle set from Embellished Beadweaving. I am really happy with how this piece turned out! 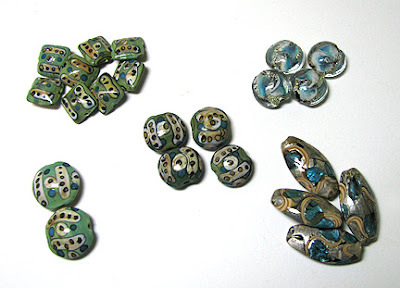 As regards FTC disclosure guidelines: I have received these lampwork glass beads free of charge from Auntie's Beads in order to write a review and/or create a project free of charge for you. I have not been paid for my endorsement as it pertains to the products received. 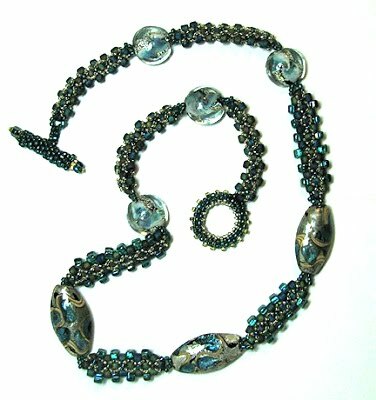 I love the technique you used to create the beaded rope - simple but yields an elegant, sophisticated result. Thanks again for another great tutorial! What an amazing loop and toggle clasp! It really completes the piece perfectly. Thanks Eileen :-) It looks much better when it is made from Delicas or another form of cylinder seed bead, but this was the color I wanted! I love the colors and the pattern is quite easy to create. The beads are eye catching. What a beautiful design. Thank you for sharing it!